P Antony, G Nair, V Jayaprakasan, M Mini, T Aravindakshan. Nucleic Acid Based Differentiation Of Pasteurella Multocida Serotypes. The Internet Journal of Veterinary Medicine. 2006 Volume 2 Number 2. Pasteurella multocida has been recognized as an important Veterinary pathogen for over a century. The organism can occur as a commensal in the naso-pharyngeal region of apparently healthy animals and it can be either a primary or secondary pathogen in the disease processes of a variety of domestic and feral mammals and birds. To treat a particular disease and to adopt effective preventive measures against the same, the causative agent has to be found out as quickly as possible. Conventional methods for diagnosis of pasteurellosis rely on the detection of the organism by microscopy and its isolation and identification. However as far as pasteurellosis is concerned it is not just sufficient to know the identity of the organism. To constitute effective control measures it is important to know the serotype of the organism. P.multocida is characterized serologically by identification of capsular antigens by passive haemagglutination and somatic antigens by gel diffusion tests. Serotyping of P.multocida is currently only undertaken by regional reference laboratories. Two typing systems are used viz. the capsular and somatic serotyping systems. The capsular antigen typing is based upon passive haemagglutination of erythrocytes sensitized by capsule antigen (Carter, 1955). Five serogroups A,B,D,E and F are currently distinguished in the carter system. A limitation of the capsule typing is the difficulty in inducing antibodies to specific antigens. Most workers find it relatively easy to make antibodies against B and E serogroup specific antigens, but not the other serogroup specific antigens. Many times a non-encapsulated stain has not been serotypeable. (Rimler and Rhoades, 1989) The determination of somatic serotypes is accomplished by agar gel immunodiffusion (Heddleston, 1962). Serotypes 1-16 have been reported. Recently a multiplex Polymerase Chain Reaction was introduced as a rapid alternative to capsular serotyping system. (Townsend et al., 2001). However by this technique only the capsular serotying information could be ascertained. Gautam et al. (2004) introduced a PCR technique specific for P.multocida serogroup A. The PCR-Restriction fragment length polymorphism (PCR-RFLP) is a technique wherein DNA sequence variation is identified by amplification of the region using PCR, followed by digestion of amplified product with a restriction endonuclease. The restriction fragments vary in size and can be revealed as different sized bands on agarose/acrylamide gels. This technique has been used by several workers to detect polymorphism within a gene segment and such information has been useful for serotyping of isolates. Heinemann et al. 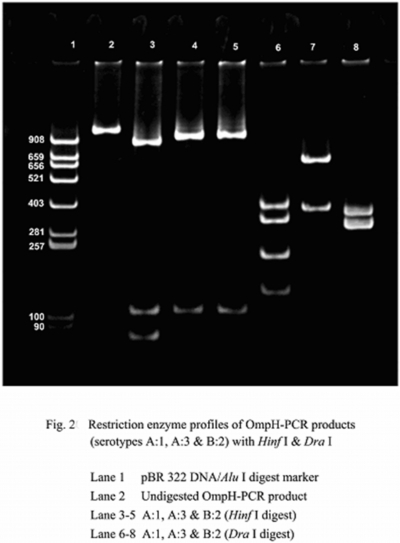 (2000) investigated the use of PCR-RFLP for differentiation of serovars using 19 different restriction endonucleases and concluded that PCR-RFLP could be used as a rapid detection technique for differentiation of Leptospira sp. serovars. Hirose et al. (2003) while studying the antibiotic resistance patterns of Salmonella enterica serovar typhi and serovar paratyphi to fluoroquinolones demonstrated the emergence of strains with mutations in the gyrA genes, using PCR-RFLP. Hong et al. (2003) used a PCR-RFLP flagellar typing scheme to successfully serotype 112 Salmonella isolates obtained from poultry. Restriction enzymes Sau3A and Hha I were used for the purpose. They concluded that PCR-RFLP was a rapid, accurate and economical approach for serotyping Salmonella species. Till date no PCR-RFLP based techniques have been used for determination of both the capsular and somatic serotyping of P.multocida. Hence the present study was undertaken with this objective. Pasteurella multocida strain DP1 and FP1 isolated in Kerala, India from a duck and fowl respectively, and serotyped as A:1 by Indian Veterinary Research Institute, Izatnagar, India and Pasteurella multocida serotypes A:3, B:2 and a duck isolate LKO, serotype A:1 obtained from Indian Veterinary Research Institute, Izatnagar, India, formed the reference strains for this study. Polymerase Chain Reaction was conducted using bacterial culture lysates as template DNA. A pure colony of P. multocida was inoculated into five millilitres of Brain Heart Iinfusion broth and incubated at 37°C for 18 h. One point five millilitres of this broth culture was transferred to an Eppendorf tube and centrifuged at 3000 x g for 10 min. The pellet was washed twice in PBS and the final pellet was resuspended in 100 µl of triple distilled water. The mixture was boiled for 10 min and immediately chilled on ice for 30 min. The sample was then thawed and centrifuged at 3000 x g for 5 min. The supernatant was stored at -20°C for further use as template DNA. A 50 µl reaction mixture was prepared in 0.2 ml thin walled PCR tube. Five microlitres of template DNA was added to a reaction mixture containing 40 pmoles each of primer OmpH 1 and OmpH 2, 200 µM of each dNTP, 1 X Taq buffer with 1.5 M MgCl2 and 2 units of Taq DNA polymerase. The amplification reaction was carried out in an automated thermal cycler (Eppendorf Master Cycler, Germany) according to the following programme, an initial denaturation at 94°C for 5 min, followed by 35 cycles of denaturation at 94°C for 15 sec, annealing at 56°C for 1 min, extension at 72°C for 1 min and a final extension at 72°C for 10 min. The template DNA used was bacterial culture lysate. The product was analysed by 2% per cent agarose gel electrophoresis . Standard molecular size marker low range DNA ruler with fragments 3000, 2500, 2000, 1500, 1000, 600, 300 and 100 bp was used as DNA molecular size marker to ascertain the size of the amplified PCR product. The amplified PCR products were subjected to restriction enzyme digestion using restriction enzymes Dra I and Hinf I. The digestion was carried out by a standard method. (Sambrook et al 1989). Briefly restriction enzyme digestion was carried out at 37°C for two hours, followed by inactivation of the enzyme at 80°C for 20 min. 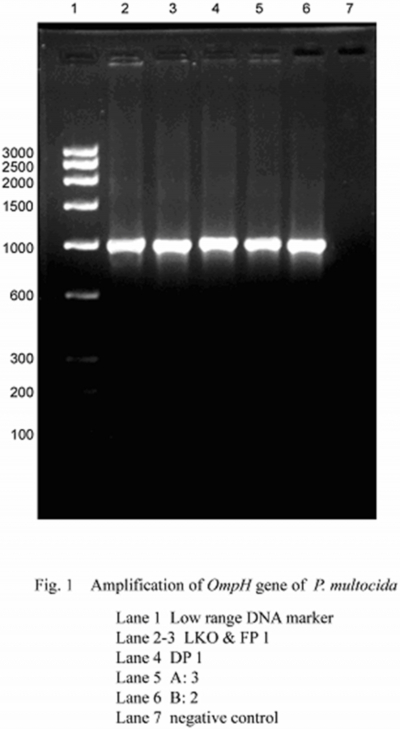 Electrophoresis of the resultant digest was conducted on 8% cent acrylamide gels. Gels were viewed on a transilluminator and photographed. Primer pairs OmpH 1 and OmpH 2 did not amplify the DNA prepared from unrelated bacterial species such as Streptococcus zooepidemicus, Staphylococcus aureus, Escherichia coli, Klebsiella pneumoniae, Leptospira serogroup canicola serovar canicola. Restriction analysis of the amplified products of serotypes A:1, A:3 and B:2 were carried out using the same restriction endonucleases Dra I and Hinf I. Enzyme Hinf I generated patterns similar in A:3 and B:2 but distinct from A:1, while Dra I profiles were distinct from each other for the three serotypes (Fig 2). The custom designed primers could successfully amplify the OmpH gene of three serotypes viz. A:1, A:3 and B:2. Similar results were reported by Luo et al. (1999) who had reported successful amplification of OmpH genes of the serotypes 1, 3 and 4 to 16 of P. multocida and the product had an approximate size of 1 kilo-base pairs. REA of amplified products of OmpH-PCR with Dra I generated distinct profiles for the three serotypes A:1, A:3 and B:2 while Enzyme Hinf I generated patterns similar in A:3 and B:2 but distinct from A:1. Thus, REA of amplified products of OmpH-PCR with Dra I offers a novel technique for differentiation of various serotypes of P. multocida. If unique patterns for all serotypes could be determined in a similar manner then we can have a serotyping technique that is simple, rapid and straightforward and can be performed in any laboratory that has the capacity to perform PCR. The development of a DNA-based technique for differentiation of serotypes could provide an alternative to conventional serotyping systems, and has a potential to overcome the problems associated with the current serotyping techniques, which rely on inconsistent expression of phenotypic traits. However, further studies have to be carried out with all the different serotypes to know whether profiles unique to each serotype are obtained, before the technique can be put for routine use. To the best of our knowledge this is the first report of the use of PCR-RFLP for differentiation of P.multocida serotypes. The authors are grateful to the Indian Council of Agricultural Research, New Delhi, India for providing financial support under the “All India Network Programme on Haemorrhagic Septicaemia”, and the Dean, College of Veterinary and Animal Sciences, Mannuthy, Kerala, India for providing facilities to conduct this study.